Nicole began her high school career at a large, traditional BPS high school before finding her true home at ABCD University High, where she has thrived in a small learning community. Her headmaster describes her as extremely bright and determined. Nicole is still deciding what school she’ll attend next year. Whatever school she chooses will be lucky to have her. Elisely is often the first student to enter her school building in the morning and the last to leave. She’s taken a demanding course load, including 10 honors classes and one Advanced Placement class. Elisely takes her role as a big sister very seriously, and is determined to be a role model for her two younger brothers. She’ll be the first person in her family to attend college. She’s headed to Northeastern University on a full scholarship! Salman is a Somalian refugee who came to the US just two years ago. After attending Newcomers Academy, he matriculated to BATA where he quickly rose to the top of his class. Salman will continue pursuing his American dream at the Benjamin Franklin Institute of Technology. At Boston’s high school for the visual and performing arts, Olivia’s artistic major is dance. She’s also pursued an interest in science, taking outside courses in human physiology, physics, and medical science studies while volunteering at the Beth Israel Deaconess Medical hospital where she shadowed a sports medicine doctor. She will continue to study science and dance at Boston University, where she has earned a full scholarship! An East Boston native, Marian attended the Eliot K-8 School before coming to BCLA. She enjoys challenging herself both academically and personally. In her junior year, Marian traveled to Malawi through the service-learning program BuildOn. This fall, Mirian will attend Boston University where she plans to major in psychology. Raheem was born in Jamaica and moved to the United States at the age of six. He’s fluent in English, Jamaican Patois, and Japanese and is learning several other languages in his spare time. He likes to read about world history and enjoys playing football. He’s a traveler at heart, but he’s not going far. Raheem will attend UMass Boston this fall. Erla immigrated to the US from Albania at the age of 15. Her headmaster describes her as a powerhouse intellectual – brilliant but humble. With a deep love for mathematics and chemistry, this STEM candidate hopes to study in an intellectually challenging environment and would like to pursue a career in medicine. As a serious female scientist and mathematician, Erla will make a big impact on the Boston College campus next fall! Originally from the Dominican Republic, Enrique credits his parents with instilling in him the importance of education. He works two part-time jobs but still finds time to balance homework and extracurricular activities. Through the Summer Search program, Enrique has explored the wilderness of the Rocky Mountains in Wyoming and spent last summer studying at the University of Delaware. Enrique’s next adventure will take him to Suffolk University where he’s earned a full scholarship. Originally from China, Jianjie is a student of the world. In 2013, he participated in a week-long workshop in Paris as the winner of the Boston Art Science Prize where he helped developed a project to better the environment. This past summer, he studied abroad in Japan. Locally, Jianjie has been working at the Brigham and Women’s hospital as a lab assistant for the past three years where he has helped build devices used during experiments. The sky’s the limit for Jianjie. Next stop: Tufts University. Isabelle is a scholar and an athlete: National Merit Scholar, editor-in-chief of the student newspaper, captain of the swim team and member of the track team. She also works at the New England Aquarium where she teaches children about marine life. She’s passionate about global affairs and has studied abroad in Ecuador and Russia. Before heading to Harvard University, Isabelle will take a gap year in Moldova to study Russian through the National Security Language Initiative. Saad came to the US from Pakistan in the 6th grade. He’s a member of the National Honor Society, the Robotics team and a peer tutor. He also participated in the Crimson Summer Academy at Harvard University, where high-achieving high school students are invited to take classes and live on campus. He plans to study Mechanical Engineering at Northeastern University where he’s earned a full scholarship. Abdah is living proof that with hard work and determination, anything is possible. Since emigrating to the US from Haiti at a young age, Abdah has challenged herself academically, taking number of Advanced Placement courses as well, as serving as a member of the Burke’s Debate Team, Vice-President of the Burke Chapter of the National Society of Black Engineers, and a part-time volunteer tutor for children in her Dorchester neighborhood. Abdah also cares for her younger sister and cousin while her mother works long hours to provide for the family. Abdah is headed to Worcester Polytechnic Institute. Since moving to the United States from China just two and half years ago, Yuzi has consistently been in the honor roll and is a member of the National Honor Society. She has been an inspiration to her peers through her work with the Chinese Immigrant Student Leadership program, helping new immigrant students find their voice and grow as leaders. Yuzi will study Mechanical Engineering at Boston University as a Menino Scholar. Raquawn has overcome many obstacles in his young life. His motivation and perseverance have made him a role model at Community Academy. He enjoys playing basketball and football, and his love of sports has fueled his desire to study sports medicine. Raquawn is still deciding which school he’ll attend next year. Naideline grew up in Port-au-Prince, Haiti and had to adjust to a dramatically different life in the US when she arrived here. Throughout her journey, has taken advantage of every opportunity that has come her way and has grown from her experiences. As a recipient of the Posse Scholarship, she will attend Bryn Mawr College where she plans to major in molecular biology and pursue a career as a pathologist. “Gigi,” as she’s known by friends, is a young lady with unlimited potential. With a GPA of 4.46, she’s an Upward Bound top scholar and the recipient of the Scientist Award by UMass Boston. She also has perfect attendance. As a member of the school's government board, she focused on improving school climate and the aesthetics of the building. Gigi is going to study pre-med at Boston University. Born and raised in Eastie, Brittany was in the fifth grade when she lost her mother to cancer. She credits her tight-knit family and her love of soccer with helping her cope with her loss and succeed academically. She helped the Lady Jets win the city championship three years in a row! She’s also a member of the JROTC. Brittany has earned a full scholarship to Northeastern University where she plans to study biochemistry and pursue a career as a forensic pathologist. Samuel also lost his mother at a young age. He overcame deep personal challenges and successfully transitioned to EDCO Youth Alternative, where he has earned straight A’s. This fall, Samuel is headed to New York City, where will attend the Parsons School of Design. Jessenia was raised in Peru and moved to the United States just two and half years ago. She entered The English High School as a freshman but quickly was promoted to sophomore. She is also one of four seniors who participated in the dual enrollment program at Wentworth Institute of Technology. Always positive and helpful to others, Jessenia has completed 60 hours of community service. She will attend Bridgewater State University where she plans to study Computer Science and Programming. Determined to succeed, Qui began studying English before moving to the US from Vietnam at the beginning of her junior year. Initially placed into ESL, she worked diligently and was mainstreamed within only three weeks of arriving at Excel High School! Qui has emerged as a student leader, serving as President of the National Honor Society and a champion martial artist. She has also participated in math enrichment summer programs at Northeastern and MIT. Qui will attend Suffolk University on a full scholarship. Laura has spent her entire educational career in the Boston Public Schools. At Fenway High, she has been an exceptional athlete, playing soccer, basketball, and softball. She is a member of a ballet/folklore dance group and volunteers at the Paris Street Community Center. Laura will attend Holy Cross and plans to pursue a career as a behavioral analyst. Abdul was born and raised in Boston. He began his high school career at a charter school before transferring to Greater Egleston, where he has thrived personally and academically. Abdul will study computer science at UMass Boston and looks forward to a career as a software developer. Working as an intern at Forsyth Dental in Cambridge, Audrey has received many science fair awards at the city, state, and international levels. Alongside her dental colleagues, Audrey has published in the American Association for Dental Research and presented at the International Association for Dental Research. When she is not in the lab, you can find Audrey competing in a Gymnastics League where she has been named an all-around champion. She was also a student volunteer for Mayor Walsh’s campaign. Audrey is a recipient of the Menino Scholarship and will study Biochemistry at BU. David is a first-generation American whose parents are originally from Guatemala. He first attended the Gardner Elementary School and has been part of the Mary Lyon community since Grade 5. David enjoys reading and playing soccer. He will attend UMass Amherst and plans to pursue a career in computer engineering. Robert’s guidance counselor describes him as a model student who has the potential to make an extraordinary difference in the world. He has excelled in academics, vocational and extracurricular activities while staying humble and keeping a sense of humor. As a result of his hard work and sparkling personality, Robert has earned a full scholarship to Emerson College. Nicole has overcome many obstacles in her life. She is the first person in her family to graduate from high school. Her teachers describe her as a determined young woman with a positive attitude. Nicole will enroll in the Job Corps Certified Nursing Assistant Program and looks forward to a career in the medical field. Originally from Ireland, Sean is an inquisitive, compassionate and creative student who has emerged as a quiet leader at his school. In his North End neighborhood, Sean works at the Nazzaro Community Center, leading children in after school activities. This fall, Sean will attend Bridgewater State University where he plans to pursue his interests in writing, journalism and sports. Fatah is the epitome of what it means to be a New Mission scholar and a New Mission Titan. He is a model student, an excellent debater, a caring older-brother and a loving son to his hard-working parents. His family came to the US in search of a better life, and Fatah has embraced every single opportunity given to him. He’s the recipient of the Gates Millennium Scholarship, the Tiger Woods Scholarship, and the Red Sox Scholarship. This fall, Fatah will attend Harvard University. In addition to being a stellar student, Daniel is involved in a number of extracurricular activies, including the Math Club, Table Tennis Club, and the Robotics Team. He also participates in SEED Academy, an MIT program for science, math and engineering, well as more than 10 Engineering projects at MIT Engineering. Daniel will attend MIT in the fall. Jonah' s headmaster says his commitment to academics and positive attitude were the keys to his success at Ostiguy High, Boston’s only recovery high school. Those qualities will certainly take him far in life! Jonah has earned a full scholarship to Champlain College in Burlington, Vermont where he plans to pursue a degree in International business. Samuel was born in China and moved to the United States at the age of three. At Quincy Upper, he is a member of the Debate Team and assists with the summer enrichment program. Samuel has studied abroad in China and has participated in the dual enrollment program at Bunker Hill Community College to advance his math skills. He’s also a talented pianist. Samuel will attend Northeastern University to study mechanical engineering as a Valedictorian Scholar. Snowden has opened up a world of opportunities for Carlos, who moved to Boston from Guatemala just two and a half years ago. He’s traveled to Japan and excelled in the school’s International Baccalaureate program. Carlos has always aspired to be an engineer. This fall, he’ll get one step closer to reaching his goal when he enters Boston University as a Menino Scholar. Growing up in Dorchester, Jamari has always taken pride in challenging himself academically. He’s participated in many enrichment programs, including Harvard University’s W.E.B. 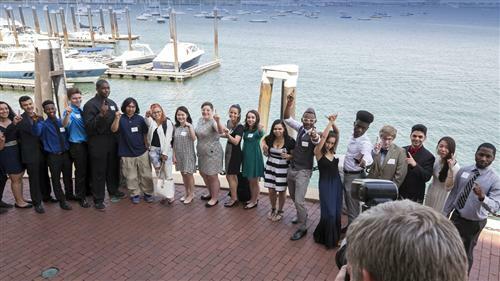 DuBois Society and UMass Boston’s Urban Scholars program. He also takes part in after-school enrichment program through Harvard Medical School. Jamari has earned himself a full-ride to Northeastern University through the Northeastern BPS Valedictorian Scholarship. Francheska hails from Roslindale where she provides community service to day care centers. At Urban Science Academy, she’s a force to be reckoned, taking part in Track & Field, a service-learning trip to New Orleans Community, and the Senior Council – all while maintaining a GPA of 4.5! Francheska's tremendous work ethic and contributions to her community have earned her a full scholarship to Boston University. Esther moved to the US from Nigeria when she was 13 and later found a home at West Roxbury Academy. She’s an avid reader and credits her English teachers with helping her discover her love of books. Esther will be the first person in her family to attend college. She’s headed to UMass Amherst where she plans to study pre-med. Highlights of the luncheon also included the Valedictorian address, which this year was presented by Fatah Adan, who is graduating from New Mission High School, and a Reflections from the class of 2015 video.